Velvet antler, together with ginseng and donkey hide gelatin are recognized as three premium treasures in Chinese traditional medicines. It has been used in oriental countries for centuries, mostly as tonic and a remedy for male impotence and female infertility, anemia, arthritis, insomnia, amnesia, etc. 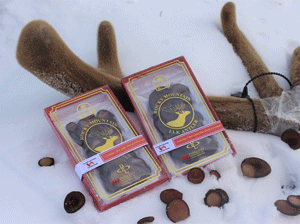 Currently, we process and export about 80% of Cervus elaphus velvet antlers harvested from stags (mostly less than 6 years of age) raised in registered Canadian and U.S. deer farms.